Atomix Virtual DJ Free Home Edition is a free and complete music mixing application for your desktop, allowing you to dump your vinyl turntables for a laptop. 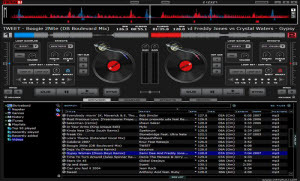 To get started, simply open your music library, and drag and drop files into Virtual DJ's decks. There's a BPM counter to help you judge transitions between tracks, and the visual wave display also helps to cue up your music. You can sample and loop tracks live, add effects, and there's a very natural-feeling scratch mode. For the adventurous, there's a lot you can add to your mixes with Atomix Virtual DJ Free Home Edition. Atomix Virtual DJ Free Home Edition is accessible to beginners and packed with extra features. The downside of the software is that it sticks too much to what a physical DJ setup is - other programs offer four decks and more user-friendly interfaces - small knobs may be great for your fingers, but they're less use on a screen.